First I should say I don’t think this is the best solution, in fact an earlier post from 2008 DIY: A wi-fi student response system is probably a solution, if perhaps needing more tidying up, but I’m posting anyway just on the of chance that this might inspire or help solve someone else’s problem. I’m in a bit of a Google Apps run. I saw and contributed to Tom Barrett’s crowdsourced X Interesting Ways to Use Google Forms in the Classroom (I added #39 Collaboratively building a timeline which I discovered through Derek Bruff’s class example. Concept: Using Google Forms as an interface for a mobile/desktop based voting system. Issue: If you are asking multiple questions the form needs prepopulating with options making it a long list for the student to navigate and potentially creating a predefined route of questions. 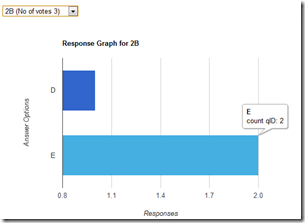 Solution: Use a generic form with one set of response options, the class using a unique question identifier for response graphs to be generated from. Some of you might already be familiar with Google Chart. This service allows you to create chart images by encoding the data in the URL. I’ve used this service in a number of my mashups, in fact all of my previous voting mashups use it in some way, and not surprisingly in Generating charts from accessible data tables using the Google Charts API. Google Chart works well if it easy for you to get the data and format it for the image URL. For more complex tasks there is Google Visualization. The advantage of Visualization is it gives you a way of querying a data source before displaying as a table or chart. To see what you can do (and the place where I aped most of the code for this mashup) you should visit the interactive gallery of Visualization examples. And that’s it. If you want to play around with this the code is here. Enjoy and if you find this idea useful or if you spot any issues as always I value your comments.